Biography of Rockin 'Chairs, the New Country band you need for your entertainment and events: concert, ball, line dance, festival, club evening, western evening, gathering of bikers or American cars, musical atmosphere, this on Paris , The Yvelines, the Paris region (Ile de France) and all over France. Rockin' Chairs was born in 2005 on a project of instrumental covers of the 60' (Shadows, Ventures ...) on the initiative of Pierre, a guitarist in love with clear and reverberated retro sounds, joined by his brother Luc on drums. They make contact at the same time with two enthusiasts of "The Shadows": Patrick (rhythm guitar) and Alain (bass) who complete the combo thus formed. The songs of the 50' (Elvis, Eddie Cochran, Gene Vincent and Co) are invited to the repertoire as well as other titles with more modern sounds (Chris Isaak, Dire Straits ...). In every human adventure, there are arrivals and departures: Patrick (also the first sound engineer and logistician of the group) changes region and says goodbye to Rockin' Chairs. Alain replaces him on the guitar and ensures the lead vocals, while Philippe joins the troupe on the bass, officiating in Swiss watchmaker on his... Precision Bass. Like from Rock'n'roll to the Country music there is only a step, the latter takes the opportunity to inoculate the group the virus of the New-Country music. The cards are redistributed again: Philippe leaves the place to Bruno, jovial bassist and double bass player, then a little later Muriel arrives, beautiful voice shaped by the jazz, that quickly makes Rockin' Chairs addicted to the feminine voices. Then it is Alain's turn to take a well-deserved retirement after thirteen years of good, loyal and friendly service within the group. Today, Rockin' Chairs consists of five musicians: two founding members Pierre (guitar) and Luc (drums), joined in 2015 by Charlotte (vocals, guitar), Sylvie (vocals and tambourine) and Adriano (bass). Officially based in Paris, Rockin 'Chairs has its own studio of rehearsal and recording in Yvelines. At an early age, Charlotte is fascinated by the stage and the music, which she realizes at the age of 17 by joining a gospel choir in which she quickly becomes a soloist and allows her to perform regularly in the Paris region. Then she meets guitarist Julien Vonarb with whom she plays in different rooms under her artist name "Charlie Gon": Le Réservoir, La Scène Bastille, Le Petit Journal Montparnasse, La Batterie. Then she joins a country music band and tours for nearly two years. In 2008, Charlie records his first single "I'm free" and later a 4-track "Fever" EP with the band Black	N'Blonde, which enjoys some success on the Internet as well as on local radio and TV. She also has nice encounters like that of Michael Jones who supports her in her projects. Charlie is a professional singer-songwriter who plays with a variety of instruments and evolves into an African-American soul tinged with pop and New Country music. Since 2014, she performs very regularly in Ile de France, in duet with François "Hubble", excellent guitarist. 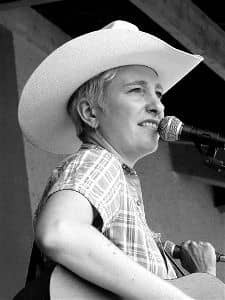 In 2015, Charlie returned to country music and joined Rockin' Chairs in lead vocal, backing vocals and guitar, where her voice, her charisma and her communicative energy enthused the public every time! Since a long time, Sylvie likes to sing, either in lead vocal or in choruses. The vocal harmonies of The Beatles that she particularly likes are probably the origin of her passion for singing. His career is quite eclectic: with his brother Bruno, singer and inseparable accomplice, she evolves from jazz to variety, passing by pop-rock and bossa nova. One of the highlights of this globe-trotter of music is undoubtedly the passage to the Printemps de Bourges with his brother, in a group of covers of the "Fab Four". From the many musical styles she practices to country music, there is only one step (of line dance, of course!) 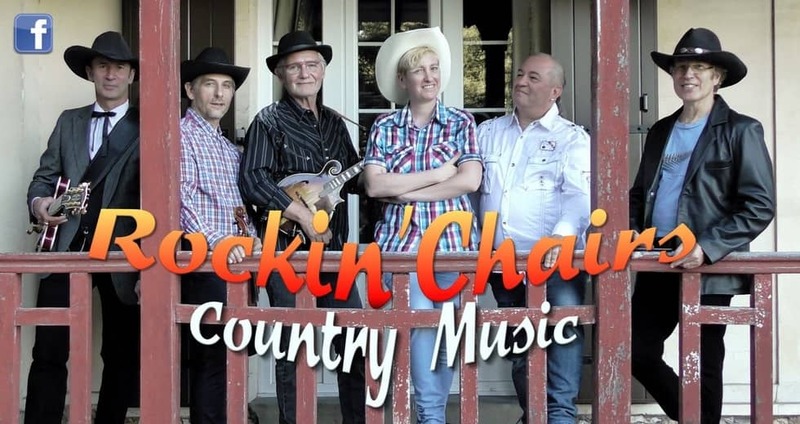 that Sylvie crosses in 2015 by joining Rockin' Chairs. Nicknamed "Calamidad" (Calamity Jane) because of the fringed jacket that she occasionally wears, Sylvie takes the lead singing, alternating with Charlie, especially on ballads where the timbre and warmth of her deep voice cannot leave nobody indifferent, this with the support of the Charlie's backing vocals and those of the cowboys of the group. And according to her inspiration, she rhythms the solos and other choruses with her tambourine. Wild West lovers will be reassured: unlike Martha Jane Cannary armed with her Winchester, Calamidad only pulls out pretty music notes! When 6 years old, Pierre knows the music theory before learning to read. After a few years of piano without great passion, he discovers the guitar when he is a teenager. It's the immediate and irreversible thunderbolt for this instrument. Alongside the classical apprenticeship of the Conservatoire, it plunges into the world of picking and bluegrass imported in France in the middle of the 70' by the late Marcel Dadi. He likes this repertoire with bulimia, but that's not enough... The listening to a piece of The Shadows, "The Flyder and The Spy", draws him irresistibly towards the clear and nervous sonorities of the electric guitar, in the opposite of the hard-rock sound then in full development. The emergence of Dire Straits on the rock scene at this time reinforces him in this research. With his first Ibanez electric guitar, Stratocaster copy, an Italian M3 amp and some pedals, he begins, as a craftsman, the research of the "ideal sound". A few years, a few bands and a few guitars later, Pierre launches the adventure Rockin' Chairs. Fine trigger of 6 strings within the band, chorister at his hours, Pierre also assumes the musical and artistic direction. 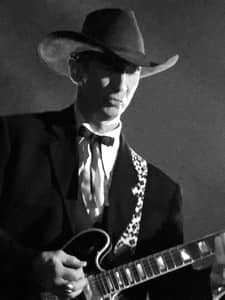 He plays mainly on a Gibson ES-355 Bigsby, plugged into a hand-wired head amp "Reverb Deluxe" with a cabinet 2x12' Eminence Swamp Thang. As of the age of six, Adriano begins to touch the various musical instruments available to the family home: flute, harmonica, accordion, violin and drums, practiced by his elder brother. 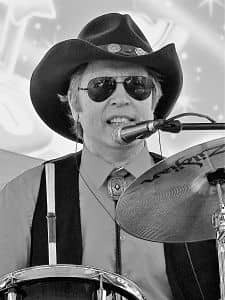 As a teenager, he works diligently on guitar and bass, and later the pedal steel guitar and piano. Then group experiences, essentially on bass: musette, varieties and blue-grass, then jazz-rock with a group that gets a first place at the Tremplin of the Golf-Drouot (France) and who makes a passage to the Pop-Club of José Arthur on France Inter radio station. Then, it's the disco, the varieties, the rockabilly with	"Rock'n'Roll Gang" which produces two vinyls (this group had accompanied Gene Vincent during its tour in France in 1967), a big-band experiment on guitar, a semi-professional period accompanying for ten years the Franco-Moroccan singer Malek, blues, funk, jazz, pop-rock, and more recently the New Country music with Rockin' Chairs. In total more than 500 scenes to his credit! Also passionate about sound technique, Adriano has developed proven skills in sound engineering to the point of owning his own 32-track professional studio. At Rockin'Chairs, with his longtime companion Vigier Arpège and a strong technique, Adriano, alias "Droopy", because "You know what? ... I'm happy!" plays the bass with brilliance and also takes the taking of sound, on stage as in studio. Between a father trumpet player, who plays at Saturday evening balls for making a little money more, and cousins musicians from father to son, Luc contracts soon the virus of shared music. In 1973, he begins on the piano, with his father on trumpet and his brother Pierre on guitar, playing titles of French variety. In 1975, he turns to the drums to ride with Pierre and a couple of buddies "l'Echo des Savates", a group with a flattering name that performs in Yvelines with titles from the sixties and seventies rock repertoire: The Beatles, Creedence Clearwater Revival, Jefferson Airplane, The Eagles, Crosby-Still-Nash, Joe Cocker, Santana ... this until 1982. Then, these are family events that give the opportunity to Luc and Pierre to replay together, accompanied by Yves to the keyboards (their younger brother) and their father to the trumpet, and also to do jam sessions with their musician cousins. In 2005, at the initiative of Pierre, it is the birth of Rockin' Chairs. Besides his role as drummer and chorister, Luc, also known as "Doc" because of his inseparable toolbox, ensures the organization and logistics of the group.